Rawas fillet crusted with a beetroot, olives and jalapeno paste. Baked. Served with a tangy starfruit relish. 1.Rub salt and pepper on the fish fillet. Sear in the pan from both sides in olive oil. 1.Add all the crust ingredients in a blender. Mix. 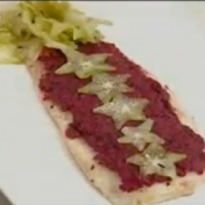 2.Apply the paste on one side of the fish. 3.Bake for 7-9 minutes at 200 degrees C.
1.In a bowl mix sliced starfruit, oil, salt, pepper, thyme and vinegar.